A confrontation between Egyptian soldiers and supporters of the Muslim Brotherhood calling for ousted President Mohamed Morsi to be returned to power left more than 50 demonstrators dead in the early morning hours of July 8, according to news reports. The killings come after a week of upheaval that started with perhaps the largest demonstration in world history when an estimated 17 million Egyptians took to the streets on June 30 to demand that then-President Morsi resign, followed by the military intervening to topple Morsi’s government, name an interim president and promise new elections. On July 9, the Revolutionary Socialists of Egypt published a statement responding to the killings of Brotherhood members and analyzing both the role of the military, which ruled Egypt via the Supreme Council of the Armed Forces (SCAF) between Hosni Mubarak’s downfall in February 2011 and Morsi’s election one year ago–and the record of the Muslim Brotherhood since the revolution and while in power during the last year. LONG LIVE the millions of Egyptians who toppled Mohamed Morsi by their valiant action, who were steadfast in protesting and defending themselves over the past two weeks. They have confirmed that the January revolution is still alive and capable of imposing its will on its enemies. Once again, the army has intervened in the political situation, committing a bloody massacre, killing tens and wounding hundreds of Islamists during an attack on a sit-in in front of the Republican Guard headquarters. The military establishment today violently and ferociously oppresses the Islamists. Despite the crimes committed by the Muslim Brotherhood at the instigation of its leadership, we do not take any pleasure in this massacre. For the hand of the army has committed the same treachery against revolutionaries before–revolutionaries who struggled toward the completion of the revolution and challenged Tantawi and Anan and their military council, while the Muslim Brotherhood and their associates joined forces with them against the revolution. The goal of this latest beastly repression is not the protection of demonstrators or revolutionaries, but “protection of the enterprises”–as a military spokesman said frankly in the press conference following the massacre. In reality, the revolutionaries will protect their marches and occupations, and fend off Brotherhood attacks against them, as we witnessed at El-Manial and Maspero. The feloul and media outlets rushed to justify this crime today with the same excuses they gave for previous massacres committed by the military council in the name of the Egyptian revolution. But the actual reason behind this massacre is to take another step on the path toward reshuffling the ruling class and establishing new figureheads. They seek to consolidate the grip of the military, which poses a danger to democracy and to the revolution itself in the coming period. This is what happened previously, when the forces of the army and military police attacked revolutionaries, demonstrators and striking workers throughout the period of the rule of the military council. WE CANNOT forgive the crimes of the Muslim Brotherhood, which shot down and killed protesters in Mokattam just days before the fall of Morsi–justifying the killing with the call to protect the headquarters and offices of its supreme guide. We will not forgive their attacks on demonstrators in Tahrir Square or the continuing attacks in the neighborhoods–the abuse of residents who opposed allowing the return of Morsi Mubarak, the dictator tyrant, to the seat of power. Within just a few days, Morsi’s supporters killed tens and wounded hundreds, committing hideous crimes in Sidi Gaber in Alexandria, in El-Manial and in many other places across the governorates and neighborhoods of Egypt. We have never and will never forget the betrayal of the Brotherhood through its alliance with Tantawi and Anan, thereafter honoring them with the Order of the Nile [Egypt’s top state honor]. We will not forget its alliance with Mubarak’s feloul after they were toppled, and the declarations of innocence for all who were their official sponsors, on top of their incitement against revolutionaries. We will not forget the defense of every crime committed throughout the period of military council rule, at Mohammad Mahmoud Street, at the Cabinet building, in Port Said and elsewhere. The Brotherhood shifted, barely 100 days into Morsi’s term, to direct attacks on the revolutionaries in Tahrir Square, and this past December at the presidential palace, among other assaults. While revolutionaries have struggled to complete the revolution against the military power which has ruled Egypt for the previous year and a half, the Brotherhood greeted the Republican Guard with acclaim and a heroes’ welcome as they entered into Mohammad Mahmoud Street, the Street of the Martyrs and the Eyes of Freedom, to secure Tahrir Square for Morsi’s speech on July 1, 2012. 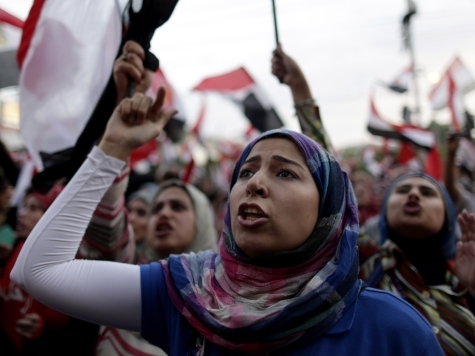 The leaders of the Muslim Brotherhood continue to criminally instigate war against the people, agitating against the revolution and mobilizing thousands for a civil war, in a miserable attempt to subjugate this thunderous wave of the Egyptian revolution. They are willing to restore the dictators to power, ready to pursue every heinous criminal method against the rights of the Egyptian people, to spill rivers of blood. They attempt to ignite sectarian strife to divide the masses, as happened early yesterday in Nag Hassan in Luxor, with the killing of four Muslims and Christians and the expulsion of Coptic families. This is in addition to their odious alliance with and assistance from the U.S. government, which is hostile to the revolution of millions of Egyptians. They trade in religion and in blood to reclaim the throne that was besieged by popular anger. In the face of the attacks of the Muslim Brotherhood, we will not take refuge in anything but our revolution, and we will protect it from any assault for the millions who have taken to the streets since June 30 through today. The people are capable of responding to any attack on their revolution. We shall continue to mobilize millions into the streets and squares, to form our popular committees to defend ourselves against the coercion of the Muslim Brotherhood. We will protect our revolution against any assaults, in the face of any attempts to circumvent it or to whitewash our demands for bread, freedom, social justice and retribution for the martyrs against the killers…all the killers. We struggle with the masses of the revolution for its continuance and for the implementation of its goals. For the revolution, there is a people to protect it. All power and wealth to the people.